A life in a webbis: BOTD : NEESYA brand collaboration with Watsons! Hello friends! How are you this Saturday morning? I am super happy to announce that Neesya Skincare can now be available ar selected Watsons Store! Neesya Skincare is an affordable premium skincare brand that is effective to revive dull skin. It functions is to smothen, brighten, and also even the skin tone. Neesya skincare uses its LumiScience Technology to helps users achieve a new degree of skin clarity, skin tone and radience. The technology combines the in-depth understanding of skin physiology, skin radiance factors and the selection of most advanced brightening, hydrating, anti- oxidate active ingredients. 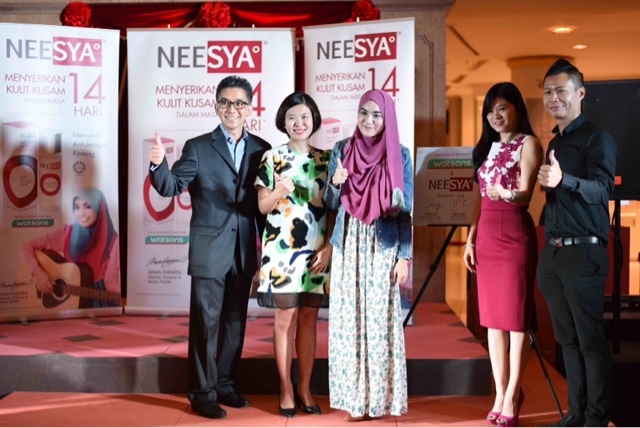 The partnership announcement of Neesya at Watsons also announced the appointment of their brand ambassador, Ainan Tasneem, a youtube sensation. Their best seller product which is the LumiScience Illuminating Essence can visibly boosts skin luminuosity with LumiScience Technology through a 360 degree approach. The key actives and functions are Silver Vine extract helps to reduce the protein carboxylation levels and enhances skin translucency. It is also inclusive of natural complex of watermelon, apple and lentil extracts to helps skin regain optimum hydration levels by restoring skin celilar fluidity and natural moisturising factors. Neesya brand will be available at Watsons Subang Parade, The Mines, Sunway Putra & AEON Wangsa Maju.